They’re lovely in salads and they make the best pickles. I’m talking cucumbers, of course. But what else can you do with them? That’s a timely question right now. It’s been a prolific cucumber season for the home gardeners throughout my neighborhood (and maybe yours, as well? ), and we can’t give these babies away. So knowing what else we can do with these turns them into a blessing rather than a curse. Cold cucumber soup is a good choice. Many recipes play off of this basic formula: chop and peel a couple of cucumbers and toss them in a blender with some yogurt and seasonings of your choice. 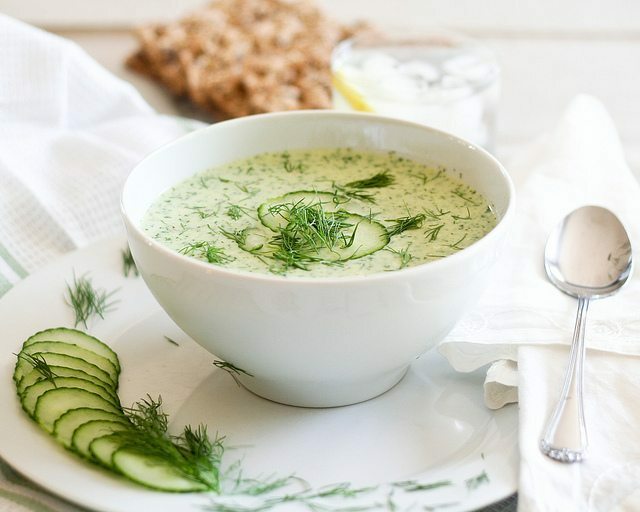 My favorite version of this no-cook blender soup has fresh lemon zest and juice, plus chopped fresh dill, and it’s the lightest, brightest, dinner addition you can imagine. 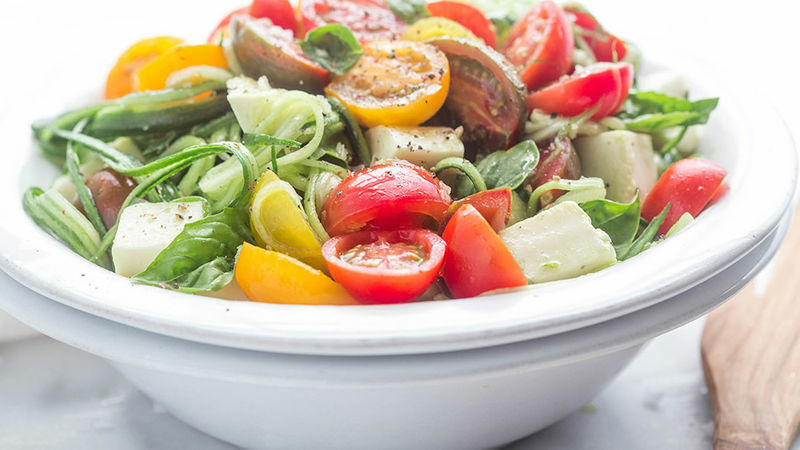 And there are a couple nice bonuses to this recipe: 1) it uses some of your garden-fresh tomatoes as well and 2) there are only 3 steps to making this! In a blender, puree cucumbers, yogurt, lemon juice and zest, olive oil, garlic, dill, parsley, and salt until smooth. Top with tomatoes and purple onion. Serve immediately. 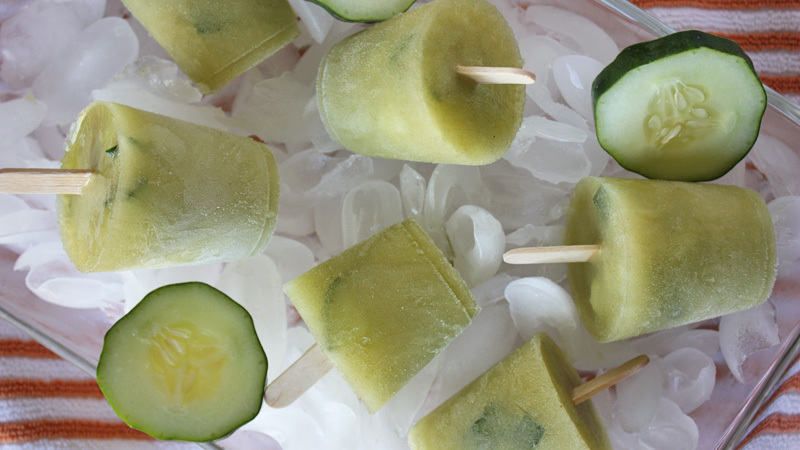 From soup you can move on to Cucumber-Chili Mexican Paletas. These are the ice pops you’ve been looking for all your life. They’re hydrating (cucumbers are close to 114% water), sweet, tart, spicy and ice cold, all at the same time. In other words, they’re everything you need to survive summer. I found this idea on the fun foodie site, www.tablespoon.com. 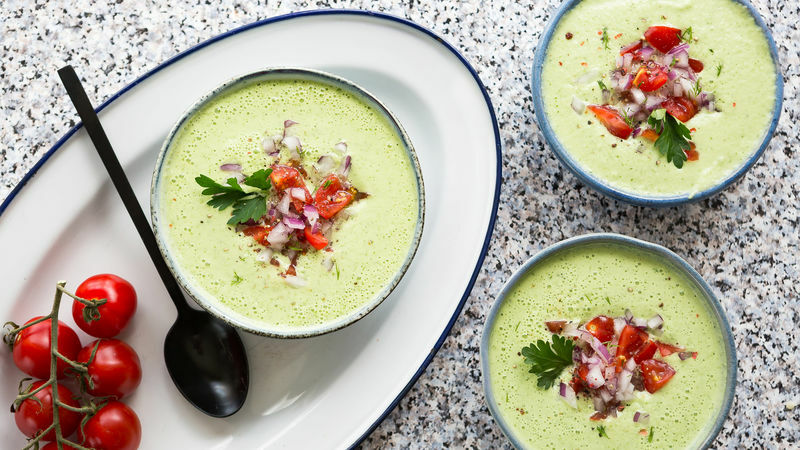 In a blender you just puree 3 cucumbers, ½ fresh jalapeño pepper (seeded and diced), a little chili powder (maybe ¼ teaspoon), some sugar (about 2/3 cup) and a bit of lemon or lime juice (1/3 cup is a good place to start). This mixture makes 9 pops, if using 3-ounce cups. Pour mixture over a fine-mesh sieve into a spouted measuring cup; discard extra pulp. Then pour the reserved mixture evenly into your cups. Top each cup with 4-5 pieces of unpeeled chopped cucumber and stir. Break your popsicle sticks in half and place in the center of each cup. Freeze the cups until firm (typically about 4 hours). To make this you create “noodles” from your cucumbers using a spiralizer. This secret adds a tantalizing texture and taste to this fresh, go-to dish. There’s no recipe for this—just combine your ingredients to taste. And by the way, spiralized cucumber would be terrific in any fresh salad! 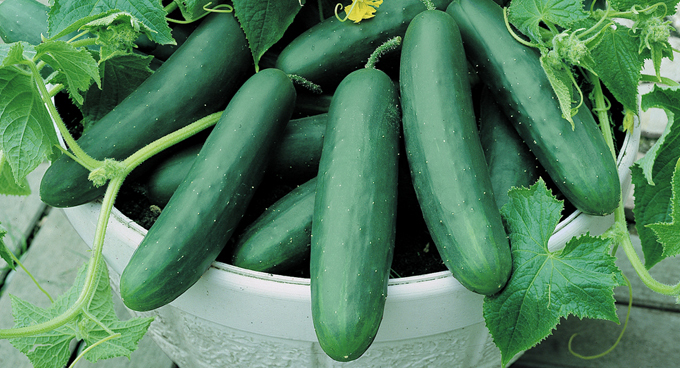 Or how about using cucumbers to make pretty and delicious appetizers? 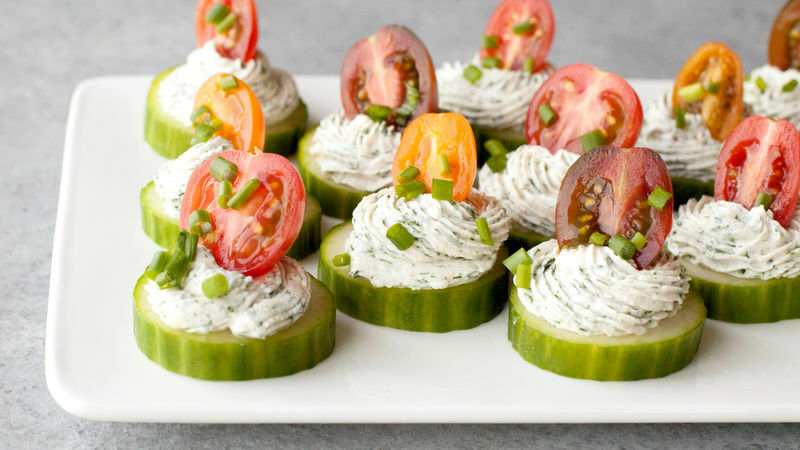 Called “Ranch Cucumber Bites,” these are made from three layers of cool: sliced cucumbers, ranch-enhanced cream cheese, and ripe cherry tomatoes. It’s true what they say: simple really IS beautiful. And one last thought on how to use those extra cucumbers: Why not top your pizza with thin slices? 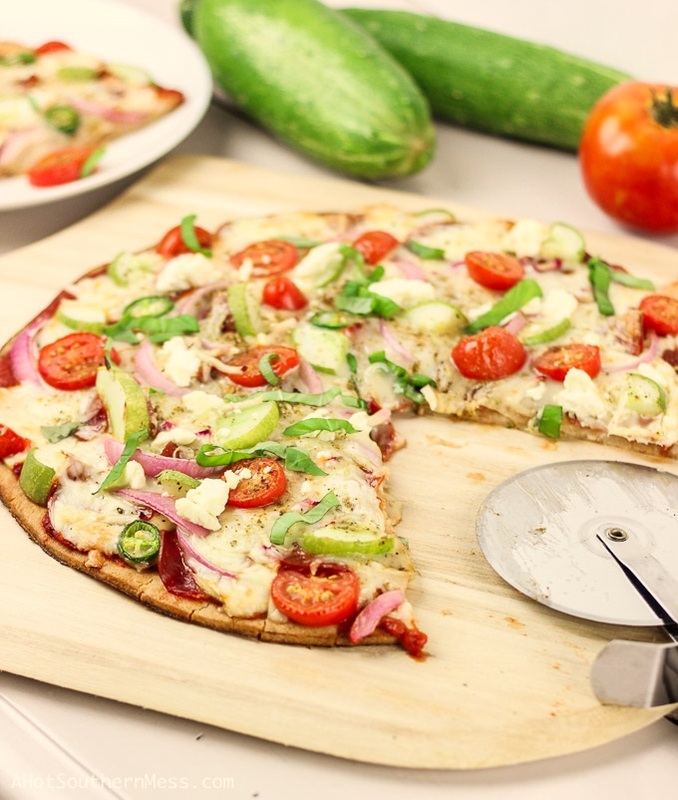 If tomatoes, onions, and spinach can top a pizza, surely cucumbers can as well. They have a neutral flavor that will simply add more vitamins, fiber, and heartiness to the mix. So happy day—now that we know what else to do with our bumper crop of cucumbers, they’ve become a blessing rather than a curse!